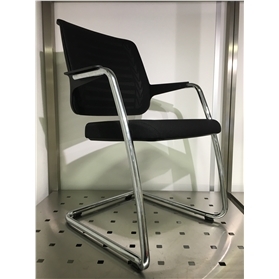 The great value for money yet with Swiss quality manufacturing the Connexion chair offers both comfort and style. very comfortable mesh back for long meetings or sitting at your desk. Stunning chrome frame. Mesh back with specially designed rear plastic supportive slats. Ex showroom sample in very good condition.